Richard Anthony Proctor [1837-1888] was an English astronomer and author who left his “largest and most ambitious work” Old and New Astronomy unfinished when he died. In 1881 he founded Knowledge, a popular weekly magazine of science (converted into a monthly in 1885), which had a considerable circulation. In it he wrote on a great variety of subjects, including chess and whist. He was also the author of the articles on astronomy in the American Cyclopaedia and the ninth edition of the Encyclopædia Britannica, and was well known as a popular lecturer on astronomy in England, America and Australia. Elected a fellow of the Royal Astronomical Society in 1866, he became honorary secretary in 1872, and contributed eighty-three separate papers to its Monthly Notices. Of these the more noteworthy dealt with the distribution of stars, star clusters and nebulae, and the construction of the sidereal universe. A chart on an isographic projection, exhibiting all the stars contained in the Bonner Durchmusterung, was designed to show the laws according to which the stars down to the 9–10th magnitude are distributed over the northern heavens. His Theoretical Considerations respecting the Corona (Monthly Notices, xxxi. 184, 254) also deserve mention, as well as his discussions of the rotation of Mars, by which be deduced its period with a probable error of 0.005. He also vigorously criticised the official arrangements for observing the transits of Venus of 1874 and 1882. His largest and most ambitious work, Old and New Astronomy, left unfinished at his death, was completed by Arthur Cowper Ranyard and published in 1892. Arthur Cowper Ranyard [1845-1894] completed the unfinished chapters of Old and New Astronomy and all 815 pages were published in one beautifully bound tome in 1892. The publication of the ‘Old and New Astronomy’ was announced in 1887, and the First Part was published in March 1888. At the date of Mr. Proctor’s death, in September 1888, Part VI had been issued and Part VII was in type. The chapters on the Planets were in manuscript, and appeared to be nearly ready for publication; but, as they had been written at Mr. Proctor’s home in Florida, where he was at a distance from libraries, more work was required to complete them than I expected when I undertook to finish the volume. The manuscript, as far as it went, ended with the description of the discovery of Neptune, the outermost member of the solar system. Distribution of Nebulae, and the Construction of the Milky Way, though it was known by his Widow and friends that he intended to make these sections a special feature of the book. It was in this department of Astronomy that he had done his most original and lasting work, work by which his name will probably be long remembered. I have, therefore, endeavoured, in the Stellar section of the ‘Old and New Astronomy,’ to give as complete a review as I could of the various theories which have been advocated with regard to the Milky Way and the distribution of Stars and Nebula. Preface by A. Cowper Ranyard. Arthur Cowper Ranyard (21 June 1845 – 14 December 1894) was an English astrophysicist. 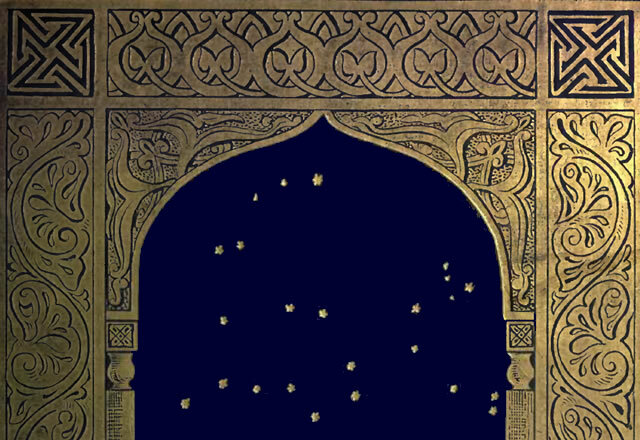 In 1888 his friend Richard Anthony Proctor died, leaving his major work, Old and New Astronomy, incomplete, and Ranyard undertook to finish it for the benefit of the author’s family. 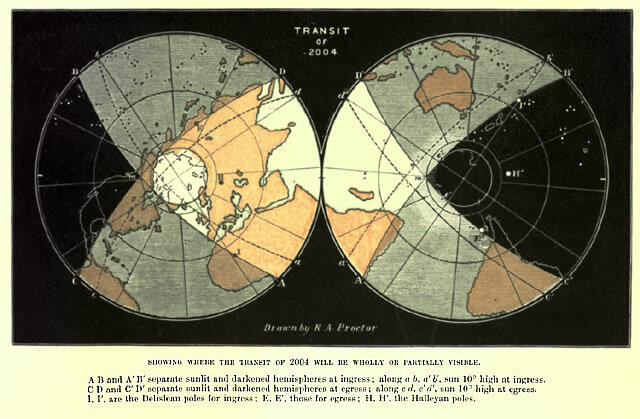 Old and New Astronomy provides a wonderful insight into astronomy around 1890 and this is [briefly] illustrated by Proctor’s predictions for the Transits of Venus in the 21st century. 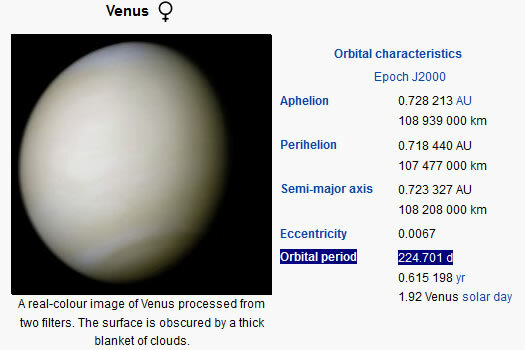 In 1892 the orbital period of Venus was stated to be 224.70 days. In 2015 the accuracy of the quoted orbital period has improved by only one thousandth of a day. The predicted trajectory of Venus across the face of the Sun was almost perfect. In 1892 the predicted durations for the 2004 and 2012 Transits of Venus were 06:01:57 and 06:19:55 respectively. The 2002 NASA predicted durations for the 2004 and 2012 Transits of Venus were 06:12:00 and 06:40:00 respectively. Therefore, Richard Proctor’s predictions were short by [about] 10  and 20  minutes. However, the 1892 predictions for first contact were only [about] 10 minutes early for 2004 and only [about] 13 minutes late for 2012. Personally, I am astounded by the accuracy of these predictions published 1892. Depending on the position of the observer, the exact times varied by up to ±7 minutes. Gallery | This entry was posted in Astrophysics, Books, Earth, History, Solar System. Bookmark the permalink. As an aside based on the timing of transit in 1882 with solar cycle 12 I predicted sc24 max as Dec 13 – not far off. Interestingly the March following transit were notably cold on both occasions. I predicted the Mar 2013 cold in the Jan (somewhere over at the Talkshop) based on that alone.